Samsung’s Infinity Display screens, which were introduced with the Galaxy S8 (Review) and Galaxy S8+ (Review), have been slowly percolating down to lower-priced models, and now the company has brought them to its budget-oriented A and J-series. 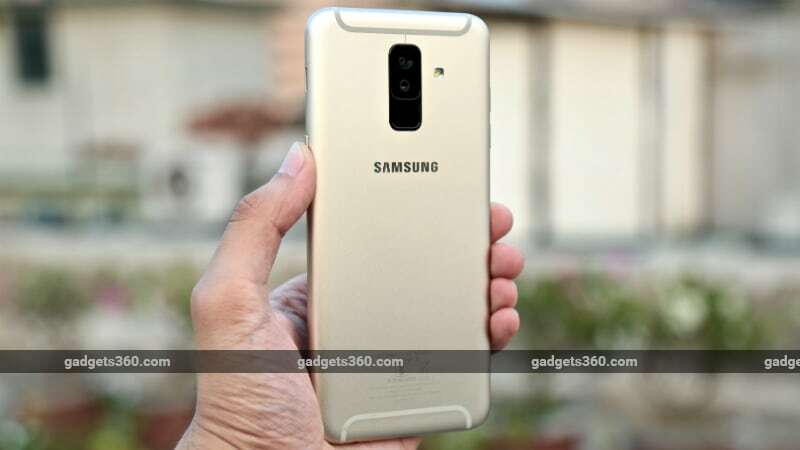 The Galaxy A6+ is one of four new smartphones launched by the South Korean giant in India, alongside the Galaxy A6, Galaxy J6, and Galaxy J8. Key features of the Galaxy A6+ include the aforementioned Infinity Display with its 18.5:9 aspect ratio, dual rear cameras, face recognition, and a metal unibody. Priced at Rs. 25,999, this smartphone aims to compete with likes of the Nokia 7 Plus (Review), a solid overall performer, the modular Moto Z2 Play (Review), and the Honor 8 Pro (Review), which has one of the best cameras in this segment. 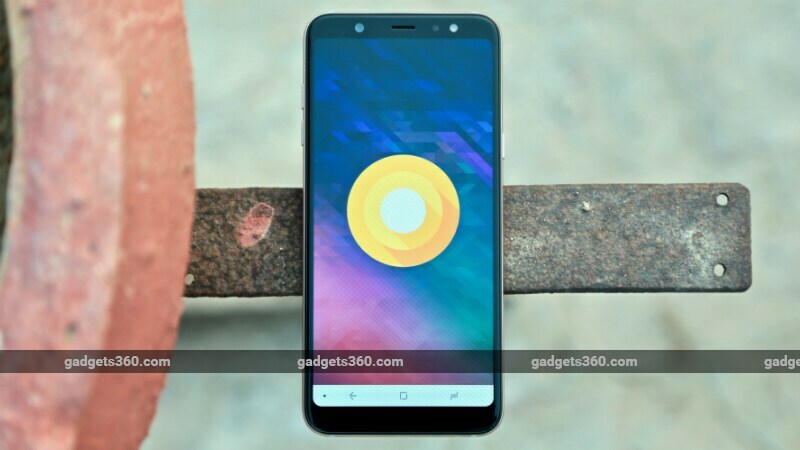 Is the new Samsung Galaxy A6+ worth its sticker price? Let’s find out in our full review. The Galaxy A6+ is made predominantly out of metal, and a result, feels quite premium. The Infinity Display dominates the front fascia but is not exactly borderless. The phone feels very solid in the hand and survived several drops during our review period. The Galaxy A6+ is available in Black, Blue, and Gold. The front face is black for all three options. While this smartphone looks premium and the build quality is top-notch, it is quite heavy (191g) and wide, which makes one-handed use very difficult. At 7.9mm, the phone is also not the slimmest out there, which exacerbates the issue. Thanks to the conspicuous antenna lines and prominent regulatory information, the back panel looks quite busy and cluttered. The fingerprint sensor is located right below the rear dual camera setup, and a Samsung logo is emblazoned below that. Not only is the sensor narrow and rather sluggish, but the location is also quite unergonomic. We found our fingers constantly hitting the rear cameras instead of the sensor. The chunky power button and loudspeaker are found on the right of the smartphone. The single speaker is loud but shrill, and its location is quite awkward. It is easy to cover the speaker with your hand while watching videos or playing games in landscape. On the right there’s the volume rocker, a tray for Nano-SIM 1, and a separate tray for Nano-SIM 2 and a microSD card. The Galaxy A6+ ships with a Samsung-branded charger in the box along with a basic pair of earphones and an extremely short Micro-USB cable. The bundled earbuds are strictly average and feel as if they belong with a cheaper smartphone. The dual-SIM Galaxy A6+ is powered by the Qualcomm Snapdragon 450 processor clocked at 1.8GHz paired with 4GB of RAM. This 14nm processor uses eight ARM Cortex-A53 CPU cores and the same GPU (Adreno 506) found on the Snapdragon 625. There’s also a non-removable 3,500mAh battery and 64GB of storage, which can be expanded via a microSD card (up to 256GB). Connectivity options include Wi-Fi 802.11 a/b/g/n, Bluetooth 4.2, GPS, GLONASS, 4G VoLTE, and a 3.5mm headphone jack. The smartphone also has an accelerometer, gyroscope, hall sensor, proximity sensor, ambient light sensor, and geomagnetic sensor. The lack of NFC and the presence of the old-fashioned Micro-USB port for charging and data transfers are both disappointing. The Galaxy A6+ supports dual SIMs but only one can run at 4G speed at a time, while the second is limited to 3G. The Galaxy A6+ has a 6-inch full-HD+ (1080×2220-pixel) Super AMOLED display with an aspect ratio of 18.5:9. Samsung usually equips its phones with stellar displays and the one on the A6+ is no exception. With great viewing angles, punchy colours and deep blacks, the AMOLED panel is the highlight of this smartphone. We are glad to see that there’s no notch, which is now a highly polarising feature. The 18.5:9 aspect ratio lends itself well to gaming and multimedia consumption and makes content look immersive. The screen also has an always-on mode that shows the time, date, battery level, and notifications for missed calls and alarms without waking the phone from sleep. The Galaxy A6+ handles day-to-day use like casual Web browsing, using social media apps like WhatsApp and Twitter, and taking the occasional picture quite well. Push the phone however, and slowdowns and stutter become noticeable. We put the Galaxy A6+ through our tests where it managed a score of 70,649 in AnTuTu, 20fps in GFXbench T-Rex, 5.7fps in GFX Bench Manhattan 3.1, and 753 and 4040 in Geekbench’s single- and multi-core tests respectively. The Nokia 7 Plus in comparison posted higher scores and handled intensive workloads better. A certain part of the blame can be apportioned to the Qualcomm Snapdragon 450 processor, which is now usually found in the likes of sub-Rs. 10,000 smartphone such as the Redmi 5 (Review) and Oppo A71 (2018), which cost a fair bit less than the Galaxy A6+. Additionally, the Samsung Experience UI’s drawn-out animations make the Galaxy A6+ feel even more sluggish. On a positive note, the Galaxy A6+ does not get warm when pushed and has rock-solid 4G connectivity. Thanks to the Adreno 506 GPU, gaming is also relatively smooth. The on-board ‘Game Explorer’ application allows you to switch between normal, battery saving, and high-performance modes before playing a game. While heavy games such as Asphalt 8 exhibit a few stutters in normal mode, the high-performance mode smoothens out gameplay considerably. As with most smartphones these days, the Galaxy A6+ also has face recognition built-in. 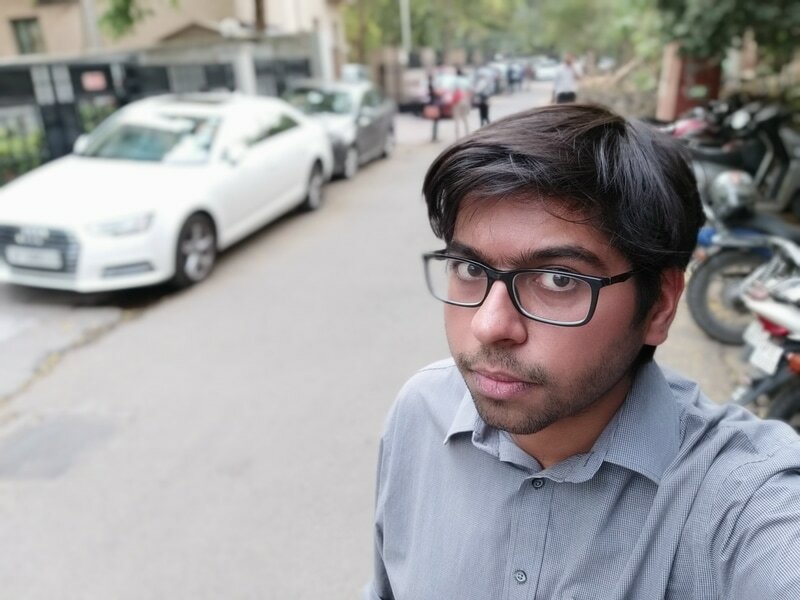 In our experience, the feature only worked well when we were facing the front camera head-on, and that too in favourable lighting. Thanks to the iffy facial recognition and slow fingerprint sensor, we found it faster to just use a passcode to unlock the smartphone. The Galaxy A6+ runs Android 8.0 Oreo with Samsung’s Experience 9.0 custom skin on top. With a host of Samsung applications competing with Google’s own, as well a suite of Microsoft apps that cannot be uninstalled, Samsung Experience is fast becoming as bloated as TouchWiz. Samsung’s own applications are optimised well for the 18.5:9 aspect ratio and are well laid out and easy to use. 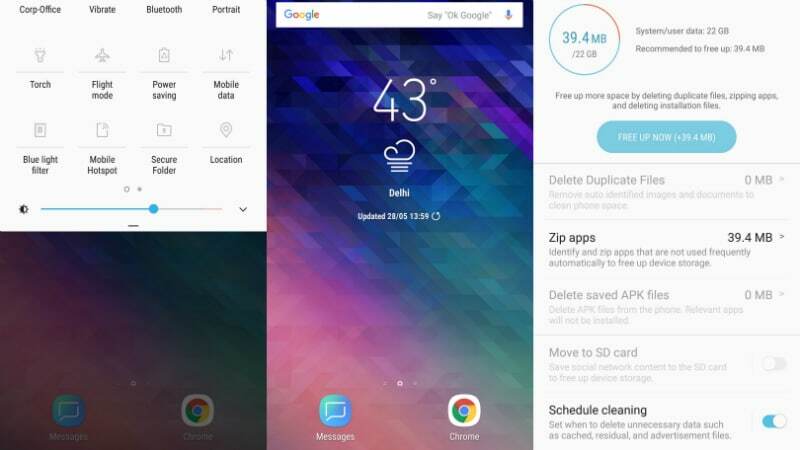 Samsung has also added a host of nifty features such as ultra data saving mode, an anti-virus app powered by McAfee, theme support, and a one-handed mode. For storage management you can move data to a memory card, delete duplicate images, compress unused apps, and delete saved APK files. A new feature called ‘Chat over Video’ allows users to chat on WhatsApp and the default messaging app whilst watching videos. 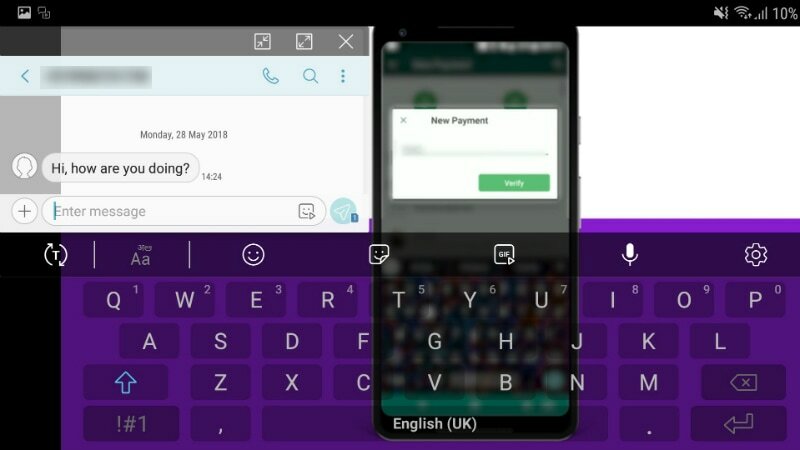 The feature, which Samsung claims has been developed by its Indian R&D team, overlays a translucent chat window and keyboard over the active video. The feature is quite useful and worked well during our use. Samsung’s proprietary applications also add some functionality. Samsung Pay Mini enables mobile payments, and Samsung Mall allows users to search for products across four e-commerce platforms using image recognition. S Bike mode was also designed in India, to promote two-wheeler safety. There is no official word on when an Android P update might arrive, though Samsung’s track record in terms of shipping updates to mid-range devices has been spotty at best. Battery life was quite good. In our HD video loop battery test, the Galaxy A6+ lasted 12 hours and 30 minutes. In terms of real-world performance, the phone easily lasted us the whole day with medium to intensive use, with some juice left in the tank. Charging was quite slow though. The bundled charger took more than three hours to charge the Galaxy A6+ fully, and it took 1.5 hours to get to 50 percent. The Galaxy A6+ features a dual-camera setup at the rear comprised of a 16-megapixel primary sensor with an aperture of f/1.7, and a 5-megapixel secondary sensor with an aperture of f/1.9 for capturing depth data. At the front, the smartphone has a 24-megapixel snapper with an aperture of f/1.9. Both front and rear cameras have single-LED flashes. The camera app is easy to use and offers multiple modes such as Night, Sports, and Panorama. There is a Pro mode as well that allows you to alter the metering, exposure, ISO and white balance. AR stickers work well and can be used with both the front and the rear cameras. There are more than 30 stickers and 50 stamps, and more can be downloaded from Samsung’s ‘Galaxy Apps’ application. 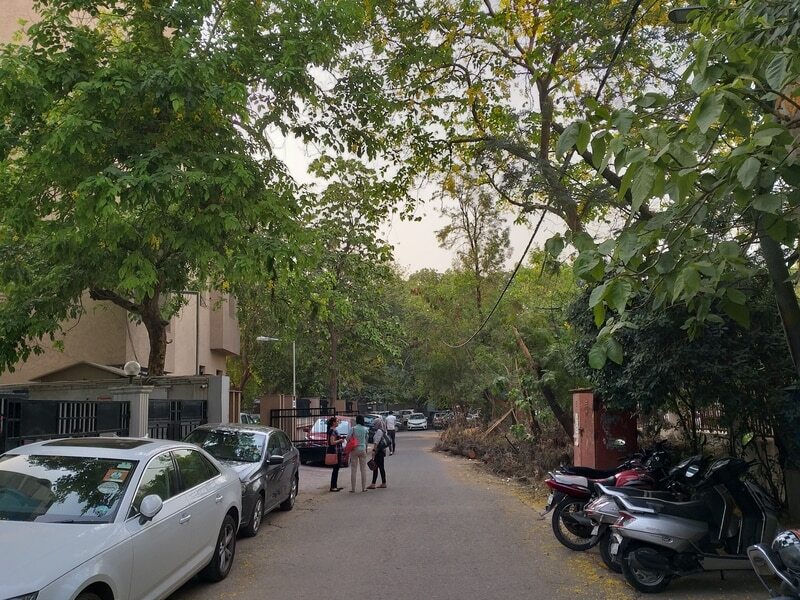 The rear camera struggles to lock focus at times, but images showed good dynamic range. In our experience, photos taken in favourable light were above average, with accurate colours and a good amount of detail. Images taken in low light though were dark and murky, and had a considerable amount of noise. 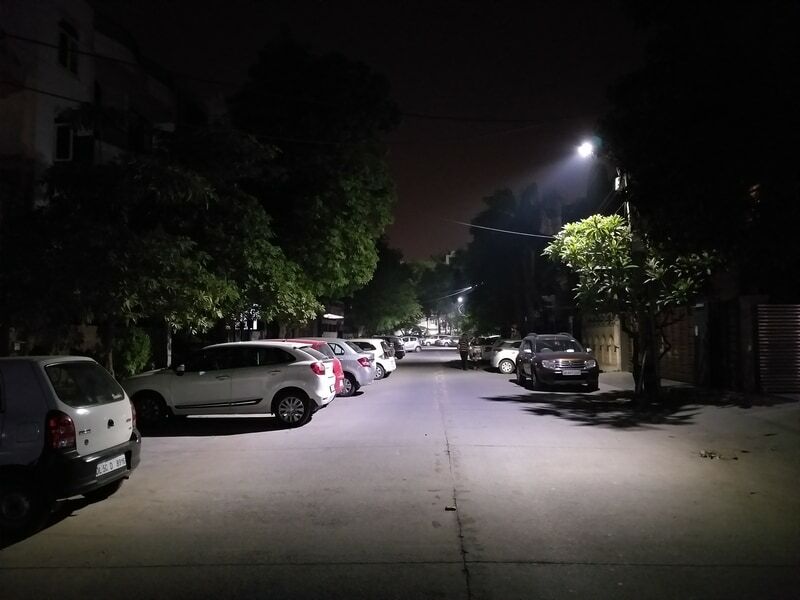 The front-facing 24-megapixel sensor captures a decent amount of detail in favourable light but also disappoints in low light, with nosy and grainy shots. The front-facing LED illuminator-type flash helps to a degree. The Galaxy A6+ is also capable of capturing bokeh shots with both front and rear cameras. 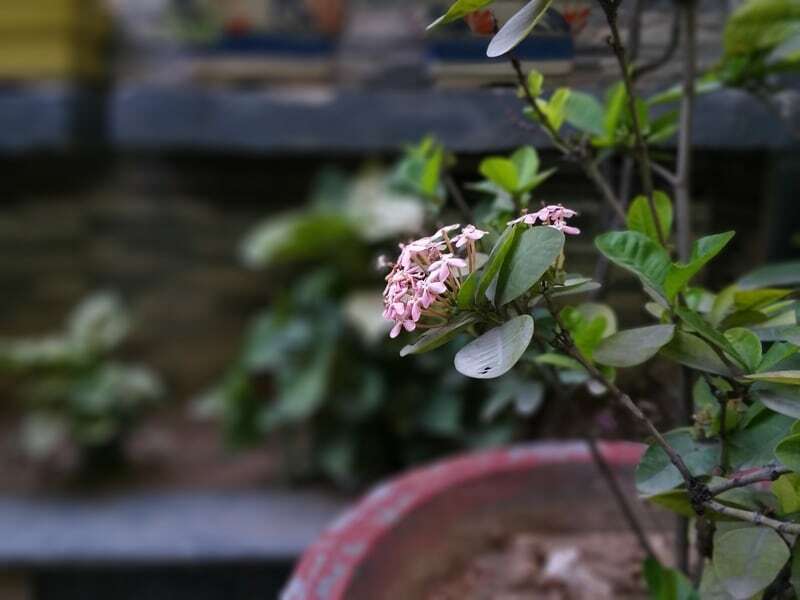 A nifty feature called Live Focus allows users to preview the intensity of the depth-of-field effect before taking photos, but only with the rear camera. The resulting shots are impressive, with good edge detection even at the highest level of blur. For blurring the background in selfies, the camera app uses software algorithms. Bokeh selfies lack detail and have inaccurate edges. Video recording maxes out at 1080p for both the front as well as the rear cameras. There is an option to record in the phone’s default 18.5:9 aspect ratio as well. Videos have a good amount of detail but suffer from focus shifting. The lack of OIS is evident, but this can be excused given the price of the Galaxy A6+. The Samsung Galaxy A6+ has a stellar display with deep blacks, punchy colours, and great viewing angles. The battery life is good and so is the build quality. Unlike many smartphones in this price range, the A6+ can be bought from e-commerce sites as well as at offline retail stores. However, at Rs. 25,990 – it is hard to look past the heavy and bulky body, unreliable face recognition, and performance issues. The camera produces good shots in favourable light but struggles in low light. Similarly priced smartphones such as the Nokia 7 Plus and Honor 8 Pro are not only more powerful, but are also more well-rounded on the whole, with stronger feature sets. The Redmi Note 5 Pro (Review) and Nokia 6 (2018) (Review) are also great choices that cost less and offer terrific value for money. Samsung loyalists can consider the Galaxy A6+ but others should take a good look at the competition before parting with their hard-earned money.